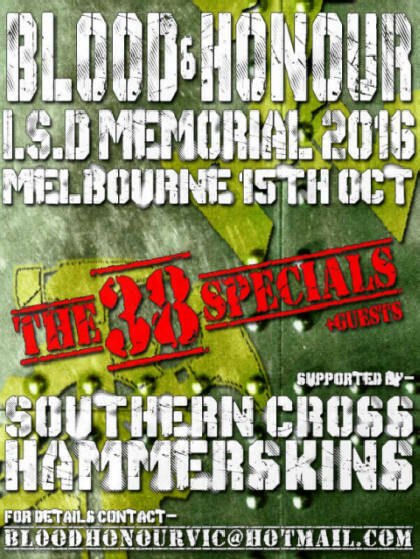 Once again Blood and Honour Australia and the Southern Cross Hammerskins organised and put on the annual memorial concert for one of the movements true heroes, Ian Stuart. We might be spread out over a large geographic area here in Australia but there is no shortage of commitment as everyone makes there way to Victoria and another awesome event. The Victorian B&H and HSN people secured a great location with many of us there on the Friday to catch up with some familiar faces. The room was filled with smiles and laughter as stories of old and new were shared with a few nice cold brews and some chilli that was a big hit! Some games of pool and beer pong ensured with one particular beer pong player showing some absolute dominance. Saturday saw the prep continue for the show, picking up attendees and sorting out any last minute details. It was great to see people coming in from literally every state and territory in Australia, and some new faces too. With a pig on the spit and everything in order it was time for a bit of competition. No words can ever do justice to how great the competitions were but it's definitely something you have to experience. Nobody was holding back and giving it everything they had, apart from some small interruptions by canine friend who appeared on the battle field and won a lot of fans. In the end South Australia fielded the winning team, but you can be sure the rest of us are already anticipating a rematch! Everyone descended onto the area where the previously mentioned pig on the spit was big hit. It didn't take long for the hungry skinheads to demolish the huge pile of food on offer and soon we waited for the call that the show was about to start. With great anticipation we watched a shadowy figure in a cowboy hat take to a stool, pick up an acoustic guitar and start to play. If you thought this was going to be some gentle country ballads you were sadly mistaken. One J Kilgore masterfully reworked some classic skinhead songs into acoustic versions and it didn't take long for people to start belting out the lyrics. Being in a mosh pit with bunch of skinheads whilst an acoustic rendition of Street Fight is getting played was downright awesome. "ISD Blues" was another standout track that brought a lot of laughs and a hell of a lot of applause. With the gig over we stayed up late into the night getting as much precious time as we could with our brothers and sisters before Sunday when everyone started to head back home. A massive thanks to Southern Cross Hammerskins and Blood and Honour Victoria for putting on a fantastic event, all the people who helped make the weekend run smoothly and for all the people old and new who attended. See everybody next year.